What’s that app to the right of the Air Drop icon?!! It’s iCloud Drive. They posted a hint on how to put it in the dock about a week or so ago. It’s located in the same place where you’re dragging AirDrop from. To the left is icloud, to the right is Activity Monitor, something this author seems to leave running all the time – it shows up in a lot of the screen shots. Hmm … Did Apple change the Activity Monitor icon from Sierra to HS? No, he is using the custom CPU Usage Dock icon for Activity Monitor. It can be found under View > Dock Icon in Activity Monitor. Shift, Command, R key combination while in Finder/Desktop, summons AirDrop a lot faster. This is a good tip though. Shift, Command, I key combination summons iCloud Drive. Where can I grab that wallpaper? If you’re on macOS High Sierra, it’s already on your Mac. I have and frequently use AirDrop on my Macbook Pro. I have typed in ‘/System/Library/CoreServices/Finder.app/Contents/Applications/’ into Go to Folder several times but get ‘The folder can’t be found’.Any idea why please? 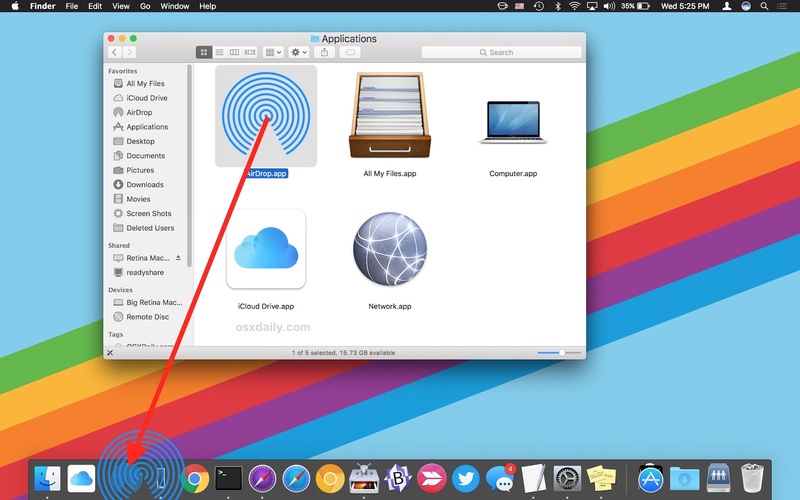 You can get the Airdrop icon much faster in the dock: Use Spotlight, then type ‘Airdrop’. Dubbelclick on that Airdrop Icon en the Mac takes you to the position of Airdrop in the Applications folder. Then you can put it from there into the dock. Finished. This is correct. Much easier. This article should be cancelled and this solution mentioned. Type into spotlight and drag to dock. Two steps!!! Perhaps you should upgrade. The longer you go without getting current, the more chance you have of not getting security updates. Apple doesn’t issue security updates for older macOS versions after a certain point. Or perhaps he’s fully justified in sticking with El Cap, which does continue to receive timely security updates from Apple. As a longtime Mac user and tech professional, I continue to prefer 10.11 for my daily tasks, because it supports third-party tools that are useful to me and that haven’t been updated to run under 10.13. As the article notes, AirDrop is available on a broad assortment of Apple hardware and OS versions, so the tip certainly should be amended, either to indicate that it applies only to certain OS versions, or to include parallel instructions for earlier versions. Some of those other applications in that folder are also handy in the Dock too! Just as easy and for less clutter on the dock is cmd-space bar and then “aird”, which will bring up the airdrop result, then press Enter/Return and voilà, Airdrop is open. On my iMac (Sierra) the folder “can’t be found”! How can it be that Airdrop ONLY defaults to Downloads folder? We should be able to direct where the airdrops go! Once again Apple engineers give us “cool” without thinking it through to make it PRACTICAL. I Googled and some folks have developed a two page, 13 step process with hints that it messes up your System disk. NOT helpful. 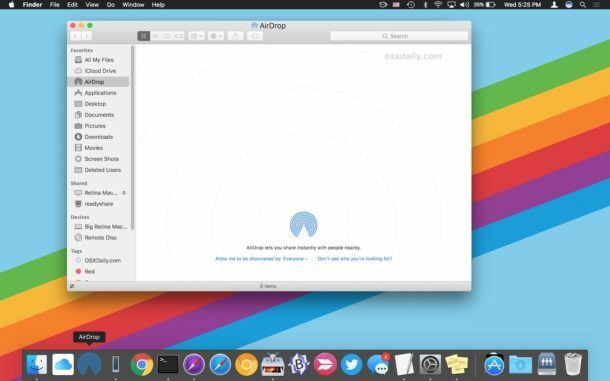 Using AirDrop is about a 2 step process: open AirDrop, send files / receive files. It is not a 13 step process nor does it do anything with your “System disk” other than either send or receive files from there, by your choosing.